Looking through the history of UIN Syarif Hidayatullah Jakarta actually means to reveal the story of Indonesian Muslimâ€™s struggle in order to have a higher education institution attributed with â€˜Islamic value, modernity, and â€œIndonesian-nessâ€. Therefore, the establishment of UIN is essentially a product of the Muslimâ€™s aspiration to establish and develop an institution to educate students and become a reliable person in response to any community needs and changing times. 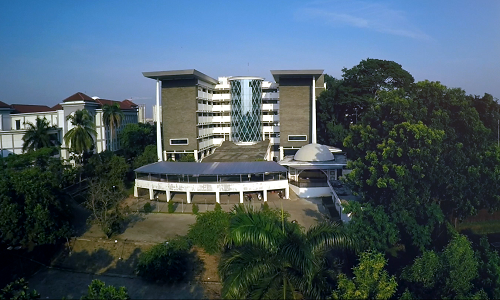 As a higher education institution, the establishment of UIN Jakarta cannot be separated from the historical development of Islamic universities in Indonesia. The embryos of UIN Jakarta can be traced back from the establishment of Pesantren Luhur (before Indonesiaâ€™s independence), then the Islamic High School in Padang and Jakarta In 1946, followed by the Islamic University of Indonesia (UII) in Yogyakarta, the establishment of the Service Academy of Religious Sciences (ADIA) in 1957 in Jakarta, until finally became UIN Syarif Hidayatullah as we see it now. UIN Syarif Hidayatullah Jakarta originated from Academy of the Service Academy of Religious Sciences (ADIA) established on June 1, 1957. ADIA itself was an official academy under the management of Ministry of Religious Affairs. ADIA was established by the Decree of the Minister of Religious Affairs, No. 1 of 1957. This institution was intended to educate and prepare civil servants to be expert in teaching Islamic courses in Secondary Schools, Vocational Schools and Religious Schools. At its inception, ADIA occupied the location of Islamic University Jakarta (UIJ) in Madura Street, before moving to Limo Street (UHAMKA now) in the following year. In the third year, ADIA moved to Culture Centrum (KS) Campus in Ciputat (UIN now). At that time, ADIA had only 43 students divided into two departments, namely: Department of Shari’a (Religious Education) and Department of Lughat al Arabiyah (Department of Arabic Language) and the Special Department for Armyâ€™s Religious Leaders as Arabic was the instructional language. Indonesian Languagewas only used as an instructional language for general courses. As a â€˜state academyâ€™, students of ADIA were qualified only for those who obtained a mandatory study from their institutions. They were employees of Ministry of Religious Affairs from various regions throughout Indonesia. At the time, ADIA was led by Prof. Dr. H. Mahmud Jonah as the Dean and Professor H. Bustami A.Gani as the Vice Dean. As of Today, the birth of ADIA is officially considered as the Anniversary of UIN Syarif Hidayatullah Jakarta. 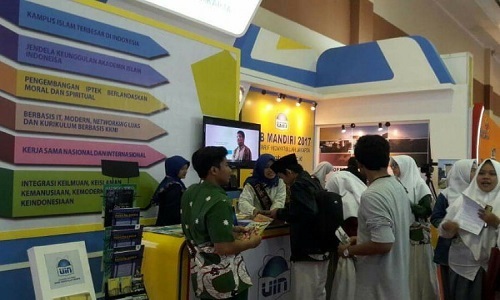 After becoming the branch of IAIN in Jakarta, student enrolment were not only made of those mandatory students, but opened also for public. Therefore, the number of students increased siginificantly to 282. In 1962, Faculty of Islamic theology was established. The Faculty itself was a metamorphosis of the Department of Da’wah wal Irshad (Department of Armyâ€™s Religious Leaders) led by Prof. HM. Toha Yahya Omar. The first lecture took place at Al-Azhar Mosque. Along with the opening of the Faculty, IAIN Jakarta then stood alone and transformed into IAIN aljamiah al hukumiyah Syarif Hidayatullah Jakarta. As mentioned in the Government Decree No. II in 1960, the purpose of IAIN was to carry out advanced education and to be a center for developing and bolstering Islamic studies. By enhancing the standard of education in the field of religion and science meant also to elevate spirituality and intellectualism of Indonesians. IAIN was then expected to be an academic expertise as well as a social institution. However, due to the Presidential Decree No.11 of 1997 on Regional Faculty Status Changes, Faculty of Tarbiyah in Pontianak transformed into State Islamic College (STAIN). By then, IAIN Jakarta no longer had no branch. As one of the oldest IAIN, IAIN Syarif Hidayatullah has a unique and strategic position. Not only is as a “window of Indonesiaâ€™s Islam”, but also as a symbol of progress of national development, especially in the field of religious development. This is because IAIN Syarif Hidayatullah Jakarta always evolves to become a leading Islamic higher education. A more intensive development took place during the leadership of Prof. Dr. Azyumardi Azra, MA. In 1998 IAIN prepared the basis towards the establishment of the State Islamic University Syarif Hidayatullah Jakarta in accordance to the concept so-called â€œIAIN with wider mandateâ€. These efforts were recommended by the Government. In 2001, Minister of National Education and Minister of Religious Affairs signed a joint Decree Number 4 / U / KB / 2001 and the No. 500/2001 dated 21 November 2001, concerning the transformation from IAIN to UIN. In subsequent years, the Draft Decree on Conversion of IAIN to UIN Syarif Hidayatullah Jakarta approved by Minister of Administrative Reform and Director General of Budgetary of the Ministry of Finance. This had become the basis for the transformation of IAIN Syarif Hidayatullah Jakarta into UIN Syarif Hidayatullah Jakarta. By this transformation, UIN Syarif Hidayatullah Jakarta is expected to encourage the integration of science both in the field of religion and humanity, with the objective to produce graduates who have integrative insight, responsive and adaptive to modern thoughts and progress of science, underpinned by faith. Integrating Islamic Value and general science is also the underlying framework of the establishment of the Faculty of Medicine and Health Sciences (FKIK) in 2004/2005. The new faculty was established based on the Decree of the Minister of Religious Affairs No.MA/25/2004 and the letter of the Director General of higher education No. 995 / D / 6/2004. As part of its goal to be a research university, UIN has committed to produce new discoveries in science, both in religious sciences and general sciences, by putting research skills as the primary qualification in any academic performance. As a Research Universities, research capabilities are the main needed-qualifications. In his adulthood, Syarif Hidayatullah returned to Padjadjaran and became the ruler of Cirebon. Since then he had actively introduced Islam in Java, especially in the western part. Later on he put his son, Maulana Hasanuddin, to the position of a missionary (announcer of Islam) as well as ruler in Banten. In 1527, with the assistance of Fala-tehan (Fatahillah), he managed to control Sunda Kelapa after expelling Portuguese forces. Syarif Hidayatullah had a major role in strengthening the rule of Islam in Sunda Kelapa which then named as Batavia by the Dutch. Therefore naming Syarif Hidayatullah Jakarta was expected to provide inspiration in the development of Islam in Indonesia.